Chronicles the illustrious 19th-century love affair between composer Robert Schumann and pianist Claire Weick. He is a revenge-obssessed stevedore whose sister was brutally raped and murdered. She is a wealthy, elusive woman. They try hard to get together... or do they? Stuck in a dysfunctional marriage, a middle-aged architect has a chance encounter with an alluring student, and begin seeing each other. He wants to be loved; she needs a meaningful relationship; however, could he be her missing father? A composer suspects his wife of cheating. He plots to kill her and frame it on her lover. Writer director Alfred Hirschmeier's film about Clara Wieck and Robert Schumann offers a parallel between Schumann and Wieck's father, who are both seen to profit from their association with Clara, the child prodigy, and when the climactic trial takes place with Clara and Schumann suing Wieck senior for consent for them to be married, one's sympathies are divided. 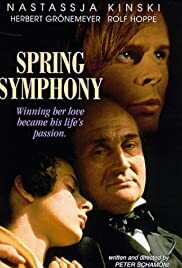 It isn't just that Schumann, who looks a good 10 years older than Clara Wieck, is the more unlikeable since he is always blaming his inability to compose on his poor financial position, and his love of Clara doesn't stop him from regular infidelities. There's also the queasy incestuous behaviour between the Wiecks, actor Herbert Gronemeyer who plays Schumann's facial resemblance to Nastassja Kinski's (she plays Clara) real life father Klaus, and Schumann being a student of Mr Wieck so adopting a father/son relationship. History tells us of the outcome, but we also get the suggestion that Clara's marriage also means the subjugation of her identity to her husband's. We are told that she became the greatest exponent of Schumann's music, but this sounds like a compromise for someone who could have been the greatest pianist of all time. Hirschmeier's screenplay is full of corny melodrama such as "How will this all end? ", "Just think how many great musicians have come before you", "If you want my life, it is yours for the asking", "I want to melt in your music", "I was struck by a moonbeam", and the inevitable classical music comparison spoken by Schumann - "Bach has the heaviness, Mozart the lightness, Beethoven the warmth, and Schubert the darkness. What do you have? The nothingness. I have the infinity of nothingness which is greater than all things together". There is also the odd use of "house arrest" described for what we know refer to as a child being grounded. Hirschmeier provides a montage of posters for Clara's concerts, a cut from news of Schumann's inability to marry another female to Clara's performance triumph, a scene where the blind touch Kinski's hands, and a sound edit from orchestral musicians tapping to horses hooves of a moving carriage. Although this biopic may spare us the Hollywood-ised cliches of composer biopics, where the music is an extension of the artist's life, the treatment here is perhaps too reverential. As Wieck senior, Rolf Hoppe makes someone that could have been played as a villian some nice touches, with Hoppe and Kinski being a more dynamic team than Kinski and Gronemeyer. There is one scene where Kinski sits in Hoppe's lap and we watch the perverse testing of where she will allow his hands to go, in spite of his own humiliation. Kinski captures the transformation of Clara from gawky teenager to emerging beauty, and whilst there is one shot where we see her hands and body playing the piano, otherwise there is no pretence made that she is performing Clara's pieces.